Roz has been around for a long time. She started out waitressing at the Rice Paddy, an old Georgetown restaurant. Eventually she opened up her own place called The Rice Mill Café located in The Hammock Shops in Pawley’s Island, South Carolina. Now, Roz is on Screven Street in the historical district of Georgetown. The name of the place has changed to Atlantic House Restaurant but the ambiance and company is still the same. For the most part, the food is just as delicious as it was in Pawley’s Island; I haven’t tried everything yet. There’s only two places in town where I would dare eat a crab cake sandwich from and Atlantic House Restaurant is one of those places. 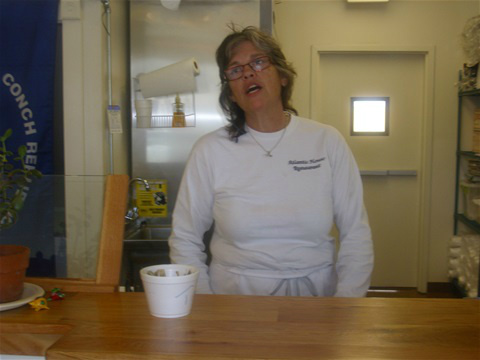 From homemade soups and sandwiches to homemade deserts and ice-cream, Roz stays packed with regular clientele. Roz does have a sign up that says to come in, grab a menu, find a table, then come up and place your order when you’re ready. My husband and I usually run in there close to opening time because we know, the closer it gets to noon, the less likely we’ll be able to find a place to sit down and eat. If we can’t make it at opening, we’ll come dragging in just before closing. One way or another we’re going to be there. For being open only 3 ½ hours a day, Monday thru Saturday, Roz does better than other places that are opened from morning to night. She opens at 11:00 AM and closes around 2:30 PM and stays busy the whole time. If it’s homemade deli food you want, Atlantic House Restaurant is just the place to go. Welcome home Roz, we’re glad to have you back.